** OPEN HOUSE: Saturday, April 27th, 1 PM to 4 PM** Opportunity awaits you in the highly sought-after 3111 VARSITY in this well-established Calgary neighbourhood. This 3rd-floor, true 1-bedroom, 1-bath condo has it all: It's ideal for a university student or working professional with close access to the University & Research Park, Foothills & Alberta Children’s Hospitals, Brentwood & Market Malls and downtown via either University or Brentwood LRT stations. A superbly-run building with STABLE CONDO FEES. Immaculately maintained + quality finishes. Open-concept kitchen with stunning features: gorgeous maple cabinetry, sleek black kitchen appliance package including a BOSCH dishwasher, built-in oven + cooktop, Whirlpool fridge + built-in microwave with hood fan, ceramic floor tiles, new countertops and faucets, a raised eating bar with pendant lighting that opens to the great room with a sunny, westerly exposure ensuring plenty of light & privacy from the windows of other units. Bedroom features a walk-thru closet, 4-piece ensuite bath with a cheater door and convenient in-suite, FULL-SIZED stacked washer/dryer included. Underground titled parking + titled storage, and gas BBQ hookup on the private, covered balcony, and comes with the A/C unit! Amenities include: Fitness centre, secure underground visitors’ parking, bike storage and a large outdoor space. All this, plus a super-quiet location on a no-traffic cul-de-sac. Whether you’re looking for an investment, first home or an incredibly well-located property in an extremely well-managed building, this is it! Don’t miss your opportunity to own this 3rd floor, upgraded unit. Only a 5-minute walk to University of Calgary. 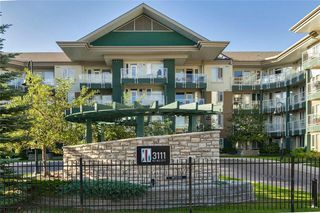 A strong condo board, well-managed & well-maintained building. See all photos, 360-degree virtual tour and the floor plan in the listing links. Call to book your private viewing today! Truly a great find. 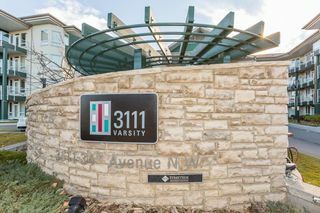 Welcome to 3111 Varsity - With contemporary architectural design, stucco exterior, glass balconies and a landscaped courtyard, this newer complex is perfect for a working professional or a student heading to classes across the street. 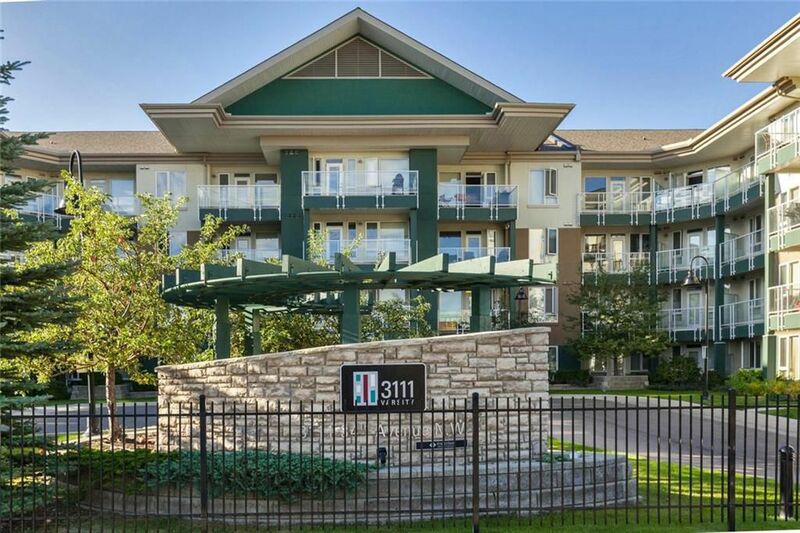 Welcome to Unit #313 - a true 1-bedroom condo, with a wonderful ensuite bath (with a convenient cheater door into the living space) and comes with a titled parking stall and a titled storage unit (which is not available for all suites in the building). Maple cabinetry, stunning black appliances and a raised breakfast eating bar are features of this open concept kitchen. Ceramic tiles, new faucets, counter tops and faucets are all upgrades from the standard condo in this building. Loads of counter space, maple cabinetry and a sleek black appliance package are all great features of this spacious kitchen. Quality appliances: Bosch dishwasher, electric cooktop and wall oven. The over the range microwave hood cover and refrigerator are Whirlpool. A "wall of windows" and the western exposure provides plenty of light. This wonderful 1-bedroom condo provides plenty of space even with traditional, larger furniture. What a gorgeous condo... don't wait -- call for your personal viewing today. The designer had envisioned a small dining area, but these owners decided a study area was more in line with their needs. A spacious master bedroom in a warm and calming colour. Of course there are a walk-through closet, an ensuite 4-piece bathroom and in-suite laundry. Walk-thru closet - one side with mirrored doors and built-ins. A nicely designed bathroom with maple cabinets and countertops that match the kitchen area. Full-sized washer and dryer located handily inside the washroom area of the unit. Your new balcony is a wonderful place to read or enjoy and unwind from a busy day! Glass balcony panels really provide a nice open feel. A nice private and covered balcony. No neighbours to peer into your windows. You can really see how close you are to the University and Research Park in this photo. Your balcony provides a nice sitting area and you can just see the location of the gas BBQ (natural gas hookup). A cloudy view from the balcony, but the western view usually provides a view of the snow capped mountain tops peaking above the city on the horizon. The welcoming front entrance is warm and comfortable for a quick gathering or when saying farewell to your visitors. Just one view of the building's fitness facility that is conveniently located on the main floor right in behind the THREE elevators. This common area courtyard is available for owners to enjoy. This common area courtyard is available for owners to enjoy. We can't wait for the grass to green up this spring! Secure bicycle storage in the parking garage. Also, there are 19 secure visitor parking stalls located underground near the entrance to the garage. There is one dedicated surface visitor parking stall and some street parking. The University of Calgary is literally across the street from 3111 Varsity. Many have said this building is more convenient than living in the residences or commuting from surrounding areas of the city.